NEWS RELEASE Armed Robbery in Grand Marsh more information on our Facebook page. 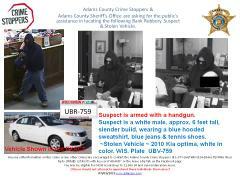 On July 3, 2013 at 9:21 a.m., the Adams County Sheriff’s Office received a call reporting a hold up alarm at the Grand Marsh State Bank located at 643 CTH E in the Township of New Chester. A second call from bank employees confirmed the alarm and further stated that an unknown male suspect had entered the bank with a firearm and demanded money. The suspect also demanded the keys for a bank employee’s vehicle and left in that stolen vehicle. The suspect is described as a white male, approximately 6 feet tall, with a slender build possible around 190 lbs. The suspect was wearing a blue colored hooded shirt, blue jeans, tennis shoes and covered portions of his face. The suspect was armed with a handgun. The suspect left the scene with an undisclosed amount of money that was placed in a small blue colored duffle bag. The vehicle that was stolen during the incident is a 2010 Kia Optima, white in color, with Wisconsin registration number UBV759 and was last seen traveling southeast. The Sheriff’s Office was assisted by surrounding County Sheriff’s Offices and the Wisconsin State Patrol in attempting to locate the vehicle. The suspect and the stolen vehicle have not been located at the time of this release. The incident remains under investigation by the Adams County Sheriff’s Office and the FBI. Anyone with information on this crime or any other crimes are encouraged to contact the Adams County Crime Stoppers at 1-877-JAILTHM (524-5846), TEXTING their tip to CRIMES (274637) with keyword “ADAMS” or the leave a tip tab on the Facebook page. You may be eligible for CA$H rewards up to $1,000.00 and can remain anonymous. Citizens should not attempt to apprehend these individuals themselves!